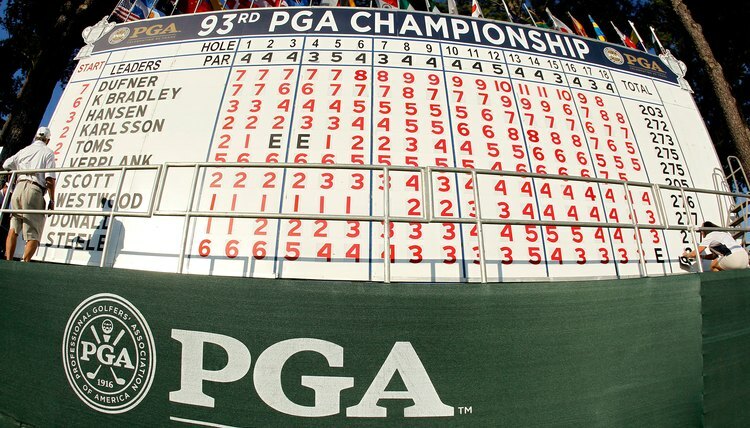 The 2011 PGA Championship scoreboard shows plenty of below-par numbers in red, and a few even-par scores in black. In the world of finance you want to be in the black, with money in the bank, rather than in the red. The situation is reversed in golf. If you are playing well enough that your name appears on a leader board, you want your score displayed in red numbers, meaning that you are under par. On a leader board showing hole-by-hole totals, birdies are traditionally displayed in red. So if you birdie a par-3 hole, the leader board will show a red 2. Black numbers typically represent pars, and sometimes bogeys as well. If you shoot par on a par-3 hole you’ll see a black 3 by your name. If you bogey the hole, the score of 4 may also be in black, or it may be another dark color, such as blue or green. Eagles and double bogeys may be differentiated with a background color, such as yellow, that stands out against a white leader board. A hole in one on a par 3 may be displayed with a red 1 surrounded by a yellow square, while a double bogey may be represented by a black or blue 5 within a yellow square. At the Masters, the leader board uses different shades of red for birdies and eagles, and different varieties of green for bogeys and double bogeys. Leader boards that display a cumulative score rarely include the total strokes a player has taken. Instead, the board will show where the player is relative to par. For example, a player who’s 5 under par will typically have a red 5 by his name, while 5 over par is represented by a black or dark 5. An even par score will usually be written in black and may be represented by a zero or an E. In Great Britain you may see a par score represented by a black L, meaning “level” par. On a match play scoreboard, red and black, being traditional golf colors, may still be employed. At the 2009 Solheim Cup, for example, the U.S. was represented by red and the European squad by blue. So if the Americans led a match by two holes, the score “2 UP” would be posted in red. If Europe led, the score was listed in blue. If the match was even, “ALL SQUARE” was posted in black. The idea of red representing below-par scores is so traditional in golf that the image is commonly used in print and speech as well. At the 2011 U.S. Open, for example, Fred Jacobson explained to reporters that the course’s wet greens were playing much slower than usual. As a result, he said, “you can go for more flags. That’s why I think we’re seeing more red numbers,” meaning birdies, or low scores.